Economists love to go on and on about “relative price distortions” – one of those inexplicable pieces of jargon that normal people just can’t make sense of. Prices that bear no relation to what things are actually worth. Prices divorced from what people would be willing to pay if you just got out of their hair. All kinds of prices are crazy in Venezuela, but let’s focus on the two craziest ones: the price of dollars and the price of gasoline. In both cases, it’s trivial to find people willing to pay way, way more than what the government currently charges for them. We know about the dollar: people would be glad to pay literally a hundred times more bolivars for a dollar than the government will accept for it. That’s nuts! But we also know that every day people in other countries pay several hundred times more for gasoline than the Venezuelan government charges Venezuelans for it. Those are crazy policies. And crazy here has a specific, technical meaning. 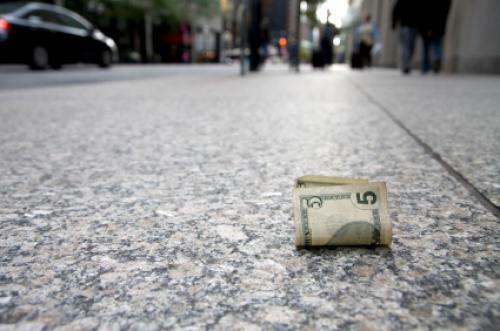 Economists like to note that you seldom find $100 bills lying on the sidewalk. If an opportunity to just pocket something of value presents itself, people take it until the opportunity disappears. After all, refusing to bend down to pick up a Ben Franklin would be really, really crazy. Well, the Venezuelan government has, for ten years, been perambulating atop sidewalks practically paved with loose $100 bills, never deigning to bend over and pick one up. People are clamouring, desperate to give the government more bolivars for each of its petrodollars. The government’s not interested. Drivers worldwide would gladly outbid Venezuelan gasoline buyers hundreds of time over for the gas PDVSA sells. The government doesn’t care. Chavismo flat out refuses to accept extra money people are practically tripping over one another to give it for these scarce, valuable things. It prefers to just crank up the BCV printing press, creating more and more bolivars and fuelling more and more inflation. Given that that’s its basic policy stance, it’s very little surprise that the government is flat broke. If you went around refusing free money all day, you’d very likely be “broke” too. But you’d be broke in a very peculiar, very specific way. You’d be broke in a way that looks almost voluntary: you’d have no money, granted. But you’d be surrounded by very low-effort avenues to stop being broke, too. It is, at any rate, a very different kind of “broke” than the way Greece – a country with tons of debt, no money and no prospect of getting any money – is broke. Venezuela is in a very different place. Greece is insolvent, we’re illiquid. It’s true, we don’t have enough money in our pocket right now to pay our debts, but no one in his or her right mind would conclude that we’re fundamentally unable to pay, except in the very strange sense that our mental health problem may now be so severe that it impossible to imagine us ever again bending over and picking up some Ben Franklins. This, I think, is the way to understand the FRod/Hausmann argument over the solvency of the Venezuelan state. And it’s why I think FRod is basically right and Hausmann basically wrong on it. What FRod is arguing is that having a government so crazy that it won’t take free money certainly constitutes a crisis. But it’s a peculiar kind of crisis, and one that rather obviously doubles as an opportunity. Precisely because the underlying policy stance is so crazy, the problems it creates are ridiculously easy to correct. You don’t even have to do that much to correct them, really. You just have to stop turning away the people desperate to give you extra money for the things you sell. That is the non-sequitur, as far as I’m concerned. It’s true, of course, that Venezuela is now so indebted that even if it somehow snapped out of its crazy-spell it may struggle to scoop up enough $100s fast enough to pay all the bills due in the next couple of years. But if it did start scooping up bills, it would become obvious to everyone that the country’s fundamentally solvent. It sits on top of an enormous lake of oil, and its debt-profile, while no bed of roses, is not terrible. The bulk of our debt matures only in 2027, after all. FRod’s point seems to me so vanilla as to be almost uncontroversial: a sanely-governed Venezuela would probably look like a pretty reasonable credit risk to an outside banker. In fact, it’s a testament to the scale of the insanity in the current economic policy mix that it doesn’t. But Venezuela paper will never look like anything other than a kamikaze run to investors so long as the government continues to make it a badge of honor to refuse to accept even a penny over $1 in return for a $100 bill.